To become a member of SMSNJ, you must attend 3 meetings as a guest. You are encouraged to bring in any models or works in progress during these 3 visits. At the third meeting, you are encouraged to bring in either a finished model or a work-in-progress. The membership will then vote on your membership. (We've never turned anyone away yet!) Dues are $20 a year, ($25 for the first year, payable upon acceptance of membership). Membership entitles you to all rights and privileges as outlined in the SMSNNJ Constitution, plus a subscription to our newsletter, The BroadAxe. Guests likewise can receive complimentary copies of The BroadAxe. However, you will require Adobe Acrobat Reader to view. You may download a free copy of the reader by clicking on the following icon. 20 Roseland Ave., Roseland, NJ, from 6:45-8:45 PM. Guests are cordially invited. Some of the highlights of our meetings are: The Tech Session, which may be a demonstration of a modeling technique, a pertinent video or occasionally, a guest speaker; Show and Tell, where members show their works-in-progress or finished works; and Books and Publications. There's lots of time to chat with fellow members during the coffee break and after the meeting, when a number of members head to the Diner for a late night snack and great conversation. Some notable special events are hosted by SMSNJ during the year. The October and April meetings are designated "Bring a Model" Night, and all members are encouraged to do just that. Given the wide range of interests and talents within our membership, almost anything can show up--and does! But best of all, in December, we hold our "White Whale" auction--a chance for members to place on the block those tools, books, pieces of wood, fittings, and like modeling ephemera that they no longer want. A good opportunity to recycle the stuff bought at the last auction. The December meeting is usually held on the 3rd Tuesday instead of the 4th Tuesday, since the 4th Tuesday usually falls very close to Christmas. 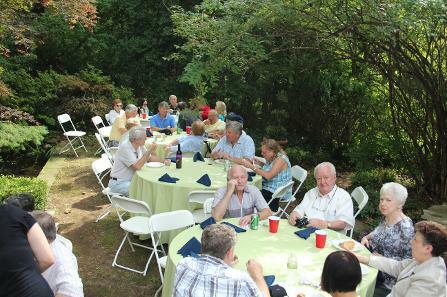 Members relaxing and being merry at one of hour yearly get togethers. 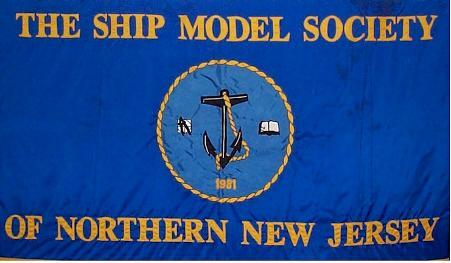 The Ship Model Society of New Jersey was formed in 1981 as a forum for ship modelers to meet and exchange ideas and information. Thirty-four people attended the first meeting on June 20, 1981, at the New Jersey Historical Society in Newark, and provisionally chose Jim Roberts, Alan Frazer and Stan Sinowitz to be President, Vice President and Secretary/Treasurer respectively. It was decided at the time to prepare a constitution and a set of goals for the club that would set certain high standards for ship modeling. At the second meeting, July 25, the site selection committee, headed by Art Bezrutczyk, suggested both Caldwell Library and Millburn library as suitable, cooperative and affordable, with Millburn eventually winning as the regular meeting place. It was also at this meeting that Michael Heinrich took over the title of Editor of the Newsletter (now known as The Broadaxe). From then on, the society has grown and prospered.